I returned to the fire damaged house to retrieve a set of books for this essay. The ones I have taken have brittle, dark chocolate edges, and smell like the death of our cats. It was not an easy task. There were two feline bodies outlined in soot upon the carpet and even the blackened walls looked like they’d been crying. With a balled fist between my teeth I willed the strength to fill up my car with the needed sorry remnants. The Homeopathic Revolution by Dana Ullman, was among them; a catalogue of 350 pages of famous people that have turned to homeopathy to heal them since its discovery in the 18th Century. Literary greats such as, Thoreau, Emerson, Longfellow, Stowe, James, Alcott, Hawthorne, Irving, Twain, Goethe, Dosteovsky, Doyle, Shaw, Dickens, Tennyson, JD Salinger and my personal favourite Gabriela García Márquez. But it wasn’t any of these that filled my head with fantasies of writing a novel about homeopathy. Instead the motivation was sparked on reading the chapter Artists and Fashionistas where amongst the pages of the Impressionist painters, Dr Paul Ferdinand Gachet struck my eye as a possible protagonist. He was a homeopathic practitioner and an amateur artist. His clientele was peppered with a group of painters who conjugated in Paris in the latter part of the 19th and the beginning of the 20th centuries. His patient list included Edouard Manet, Claude Monet and most famously Vincent Van Gogh. Gachet is reported to have saved Camille Pissaro’s brother’s life, with homeopathy, when allopathy failed to help. Being a homeopath myself and having a personal interest in Ullman’s research and reportage, I read The Homeopathic Revolution in 2007 when it first came out. It was to be another two years before my desire to write about Gachet finally materialised. When my husband died suddenly in July 2009, grief forced me into early retirement or an extended sabbatical (life being what it is you can never really tell). I needed to get through my days and I desperately craved to escape from reality. I began to think seriously about beginning my first full-length novel. I didn’t realise it at the time but I had already collected quite a lot of research. 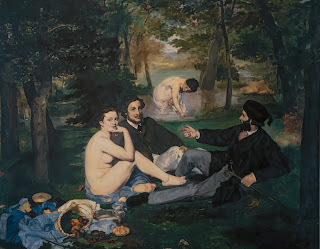 Some of it stumbled upon quite randomly, when, for example, one evening I tuned into Sky Arts to discover a documentary about Edouard Manet’s masterpiece, Dejeuner sur l’Herbe. Manna from heaven. My interest in this charismatic man was ignited through the intriguing image of a naked Victorine Meurent, sitting on the grass, staring out of the canvas, whilst surrounded by trees, water and strangely, two clothed men who happened to be Manet’s brothers. Even more captivating is the story behind the work. Dejeuner sur l’Herbe (pictured above) was ridiculed during its exhibition at the Salon des Refusé in 1863. This event alone was responsible for propelling the artist to fame. I already knew that Manet was an acquaintance of Gachet and that they both took part in Parisian café society. Rebel in a Frock Coat by Beth Archer Brombert, a biography on Manet, informed me that he was not just controversial and mysterious in his artistry, but he was also enigmatic in his private life too. He lived half the week with his mother in their family apartment in one of the most prestigious roads in Paris, and for the other half he lived with Suzanne Leenhoff in a bourgeois home on the other side of the Seine. When he stayed with his mother he attended soirées, was charming and witty and definitely a ladies man. Suzanne was unfashionable and considerably older than Manet. She had been his piano teacher when he was a child. There was a boy called Leon who also stayed in the apartment. Brombert believed that Leon was Suzanne and Manet’s son, mainly because at the end of Manet’s life he included the boy in his will. In the writing of Mesmerised, I explored a more shocking possibility for Leon’s ancestry, based on a rumour that Brombert also refers to in her book. My fascination for the era and Gachet’s world had taken its hold upon my imagination. I went to Paris many times, traced the route from Gachet’s apartment in rue Faubourg Saint Denis to the Boulevard des Italiens where many of the cafés were situated. I stood outside his apartment and imagined overhearing the residents in the courtyard behind the large, royal blue door. I explored the Louvre and the Musée d’Orsay, and hunted for Blanche’s house (Gachet’s sweetheart), which I eventually found close by the Quai d’Orsay. I ambled along the embankment to Victorine Meurent’s studio in the narrow cobbled lane of rue Mâitre Albert. My hotel was near Pigalle, almost opposite Le Moulin Rouge which was built after the time I write about in my book, but nevertheless infuses me with a certain mood, one that carries the scent of tart au citron, Arabian coffee and patchouli. I climbed the steep steps up to Montmartre and drank wine overlooking the square. I watched street artists set up their easels and draw caricatures of tourists. 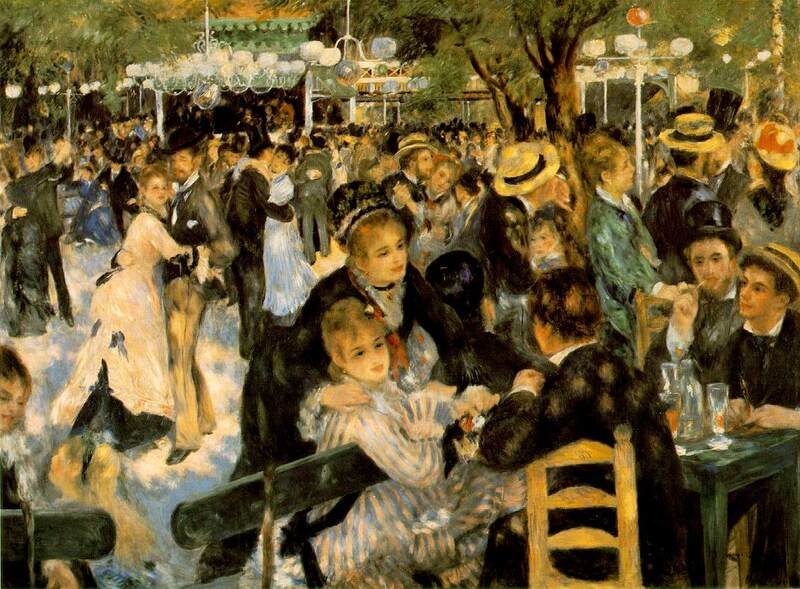 There is a restaurant that sells beer, moules frites and onion soup from the plâts du jour on the very site, I imagine, of Renoir’s Moulin de la Galette (below). When I discovered that there was to be a festival in Auvers sur Oise to celebrate one hundred years since the death of Dr Gachet, it appeared to me like another gift from the gods. A wonderful opportunity to soak in the atmosphere of the village where Gachet lived as a family man and where his friend and patient Vincent van Gogh came to stay and died. So, I went back to Paris and took the train. How wonderful to have seen the garden famously painted by Cezannes - Gachet’s neighbour - with the section where Gachet grew his own medicines. I was enchanted too, by the restaurant where visiting artists came together to drink and dine, a place that’s been preserved museum-like. And chilled by the spot outside the church up in the hills where van Gogh shot himself and the spartan room where he later died. Portrait of Dr Gachet (picture at the start of this essay) by Cynthia Saltzman, which told the story of the van Gogh masterpiece, at one time the most expensive painting in the world. Alias Olympia by Eunice Lipton, a quirky biography of Manet’s model Victorine Meurent. Zola’s The Masterpiece and L’Assomoir, both of which allowed me to immerse myself in the eloquence of one who had lived the time and place. A book lent to me by a very cool, very young, artist friend of mine called The Private Lives of the Impressionists by Sue Roe which collated many anecdotes and brought characters to life. So that when my friends in the Nomads writer’s group started presenting the beginnings of their novels and encouraged me to do the same, I was ready, but nevertheless felt weighted down my own high expectation for the text. Nevertheless, on a cold and miserable October day, I began the novel, and each subsequent day I was lured to the keyboard by a world that I found delicious. I was overwhelmed by the drama that was playing within my mind. It was the perfect antidote to my sadness. My therapy. Post-it notes soon mushroomed all over my desk with ideas for scenes, subplots, conversations and sometimes, just sentences or isolated words. Behind my desk I created a collage that included portraits of the characters, images of Manet’s paintings Dejeuner sur l’Herbe and Olympia (below), a map of Paris that I referred to many, many times, plus photographs of places that appear in the book. The hospital, La Salpêtrière, for example, which amazingly, is exactly how I envisioned it, down to what I had come to think of as ‘Gachet’s tree’, right there in the middle of the grounds. The hospital today is on an avenue just outside the main environs of Paris. In the mid nineteenth century it would have stood in a more rural setting. Then there are Michelangelo’s marble sculptures, Slaves (below), in the Louvre. I sat before them for hours on a bum-numbing wooden bench and observed how the light played on the statues and on the floor at various times of day. I listened to the sounds of visitor’s footsteps and whisperings and tried to discern the hall’s unique smell. When I took the photograph I knew that there would come a time when my elite group of artists, or some of them anyway, would go there to sketch. There was a time when I wanted to write a contemporary, political thriller that challenges the myth that homeopathy cannot possibly work. This is a belief perpetuated by a group of eminent medics who rally on the side of the pharmaceutical industry and a current situation that led me to mastermind the original Homeopathy Worked for Me campaign in 2006. The main premise of my story was to be a healing process, one that is refuted by science, but nevertheless confirmed through the eyes of a homeopath; a child’s autism reversed by homeopathic medicine as written about by Amy Lansky in her biography The Impossible Cure. I began the narrative several times in different ways but found my own prejudices creeping overtly into the text, and because of this, each attempt was subsequently thwarted. On reading Clemens van Boenninghausen’s writings (Gachet’s mentor in Mesmerised) I began to understand that the political situation concerning homeopathy then, was not dissimilar to how it is today. Knowing that Gachet had written about nervous disorders and that he worked at La Salpêtrière helped me to transport my original idea into the past. But instead of autism the patient’s diagnosis in Mesmerised is mania and madness - what now would be termed schizophrenia and acute psychosis - two pathologies that I have worked with extensively in my own homeopathic practice. I was also able to draw a parallel between homeopathy and Impressionism, both similarly frowned upon by their respective governing bodies in mid-nineteenth century Paris. A circumstance that forced practitioners of these two pursuits to live outside the accepted boundaries of society, determined to continue doing what they believed in and what they thought was right. Both homeopathy and Impressionism are concerned with making manifest what lies hidden beneath the surface. They explore depths, seek out essences, and hold a mirror up to the world in a quest to find harmony. The two practices make perfect bedfellows, especially at that time in history, for these days, although homeopathy is still derided, Impressionist art is now lauded for having been avant-garde. Before I began Mesmerised, I had a vision of how I wanted the final book to be; the type of writing, the language, and the world both real and imagined. On reflection I can see some of the influences that have paved the way for me: D. H. Lawrence who was unashamedly uninhibited and controversial in his writing. Philippa Gregory who did not censor her imagination when it came to depicting Anne Boleyn in Tbe Other Boleyn Girl. Ian Mc Ewan, whose characters in Atonement are believably historic but also, somehow, modern . Rose Tremain who in Restoration, found a political parallel in former times; ‘Restoration was built on high Thatcherism…’, she is reported to have said. The structure of Mesmerised is a simple one, as I was writing, the main plot seemed to weave naturally around true events that happened, predominantly, in 1863. But the biggest challenge was making sure the homeopathy was right, not too complicated but also not banal. It helped having studied the work of Rajan Sankaran, a man who is on a lifelong quest to grasp the full extent of homeopathy. Involving his knowledge of nature in his observations makes his books so much more than just a lesson in homeopathy. His effect on my clinical understanding is indelibly sewn into the writing of Mesmerised. I am most conscious of using An Insight into Plants, The Soul of Remedies and Structure for greater understanding of remedies, Phosphorous, Ignatia, Belladonna, Platina and Veratrum Album, all of which were prescribed by Gachet in my book. During my visit to Gachet's house, I was informed by a steward, that most evenings Gachet sat in an arm chair reading Samuel Hahnemann’s Organon and The Chronic Diseases. The thought of this made me smile; like myself, he was an earnest practitioner. When I wrote the homeopathic textbook What About the Potency? I took time away from a busy practice to do it. I had a few scribbled notes and a huge amount of concern about my ability to articulate what I had learned through experience. A nagging feeling in my solar plexus kept urging me to try. So I ran with it. Today, What About the Potency? is on the required reading list at the Centre for Homeopathic Education in London, has sold all over the world and is now into its 3rd edition. That feeling in my solar plexus was also there during the writing of Mesmerised. The creation of Mesmerised was a much needed joyful experience, in an otherwise cruel, and difficult time in my life. Brombert, Beth Archer (The University of Chicago Press, 1997) Rebel in a Frock Coat. Shine, Michelle (Food for Thought Publications, 2011) What About the Potency?